The civil society across the region demands a change and slowly shapes e-Democracy initiatives. If e-democracy tools meet the public and political support, they will allow for wider and broader citizen’s participation and involvement in decision-making. The ELF Workshop “Digital Democracy and e-participation. Inclusive Governance in Southeast Europe” was the first of three ELF workshops, researching and assessing the current trends and best practices in the area of e-Democracy in Southeast, Central and Northern Europe. 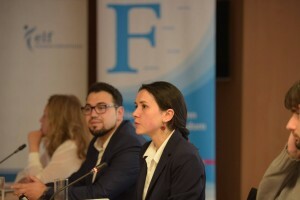 The event was supported by the Project office for Southeast Europe of the Friedrich Naumann Foundation for Freedom and was held on the conference premises of the Permanent Representation of the European Commission in Sofia, Bulgaria on 29 May 2017. 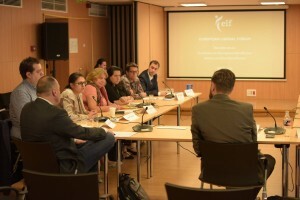 The workshop outlined a topical discussion among practitioners, civic activists, and state officials from Bulgaria, amongst which representatives of the Central Election Commission, the National Agency for E-Governance, and former e-Government advisors. A central part of the event were the nation-case presentationsy Areti Georgilis, Board Member, Liberty Forum of Greece-Markos Dragoumis, and Elena Ghioc, Co-Founder of InitiativaRo, Romania, who fostered a debate on the exchange of best practices among the three Balkan countries. The region of Southeast Europe is still not making use of the technologies when it comes to good and participatory governance and the progress so far remains limited to individual projects, with a very narrow scope. Despite the significant technological preconditions and the ever-increasing use of technological devices and internet, the country’s traditional governance model still largely excludes technologies. This is to be observed not only by the underdeveloped e-Government services but also by the lack of government-supported e-Democracy initiatives, which could enable a broader and deeper participation of citizens in the decision-making process. The working examples to date have been entirely led by civic projects, as the e-Referendum initiative in Bulgaria, Presented by Daniela Bozhinova, or the e-procurement platform for monitoring public procurements in Romania, explained by Elena Ghoich. An interesting example brought to the discussion was the online recruitment of members of the Liberal Party of Greece, who will be all involved in the decision-making process once the party comes into power. An isolated case of state proactive attitude, when it comes to encouraging civic participation through technologies, is the e-voting experimental pilot projects, which are to be implemented in Bulgaria starting next year, with e-voting entering into force in 2019. As the main institution in charge of the project, the Central Election Commission is currently assessing the experience of other countries and together with the e-Governance Agency, the Commission is conceptualising the e-solutions that need to be in place to run the experiment, as explained by Commissions President Ivilina Alexieva. Whether it is for e-voting, e-referenda, e-consultations, or citizens’ mobilisation initiatives, building trust in the offered e-solutions is of paramount importance. For this to be achieved, the entire design needs to be developed based on open source, open data, and strict personal data protection rules, according to Bozhidar Bozhanov, former e-Governance advisor of the Bulgarian government. An alternative approach will irreversibly create doubt in the process, jeopardising the success of any initiative. The workshop also reaffirmed the existence of different perceptions of democracy and citizenship across Europe, highlighted by Daniel Kaddik, Project Director of FNF Southeast Europe, and Ivaylo Tsonev, Project Coordinator at the Foundation. Contrary to countries like Estonia, which are proud of their e-Governance achievements and of how far they have reached in ensuring the highest effectiveness and optimised cost for better governance, the region of Southeast Europe is still struggling against its established top-down governance approach. An understanding of policy making that conceives politicians as sole policy executors, thus no investing in projects that could open the governance and practically empower the general public. Hence, projects that motivate citizens to be engaged and take the governance in their hands, scrutinise public affairs, and demand accountability are seen as necessary key fundaments towards an overarching e-Democracy in the region.